It’s easy to make Perfectly Broiled Scallops with a Parmesan Crust. In minutes, you will have a memorable dinner or appetizer. Easy Party Food. These Broiled Scallops with a Parmesan Crust are truly deserving of this title…and I can attest to that. We enjoyed them at a recent family gathering along with lots of other goodies. It was a Mother’s Day celebration for my fantabulous mom! Why, you may ask, is this recipe so easy to enjoy? And, the answer would be: The scallops can be made ahead of time, frozen and then broiled to perfection in just 10 minutes. 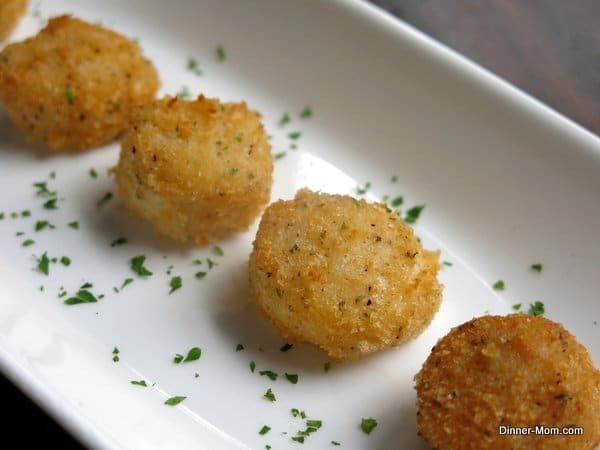 I also have some tricks that make breading the scallops fast and not too messy…it’s the same process used make Parmesan Chicken Nuggets, which also uses the same breading! Important Note: The instructions below show how to use several plastic bags to prepare the scallops. You can absolutely forgo the bags and follow the traditional method using bowls! Both methods are provided in the recipe instructions. 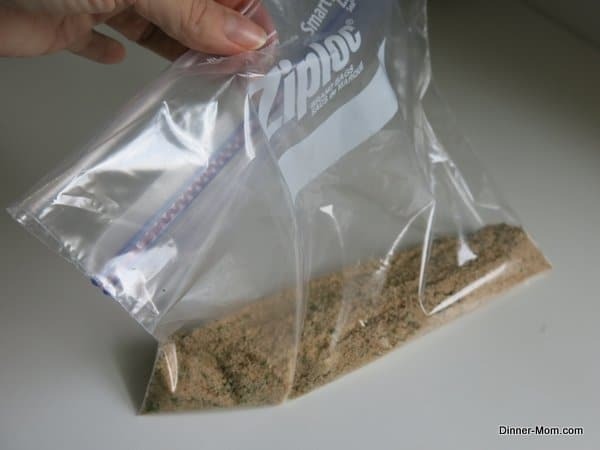 All of the breading ingredients – seasoned breadcrumbs, Parmesan cheese, finely chopped parsley, paprika and pepper – go directly into a plastic bag that seals. Shake to combine the contents. These are the canisters we used at our meal assembly store to stabilize the plastic bags as customers filled them. Check around the house. You probably have a bowl or something else that will do the trick. They are very handy. Pat the sea scallops dry with a paper towel and put them in a second plastic bag (not the one with the breading.) Melt the butter in the microwave oven and stir in the olive oil. Pour the butter mixture over the scallops, seal the bag tightly (note the added emphasis) and turn the bag to coat the scallops with the butter sauce. 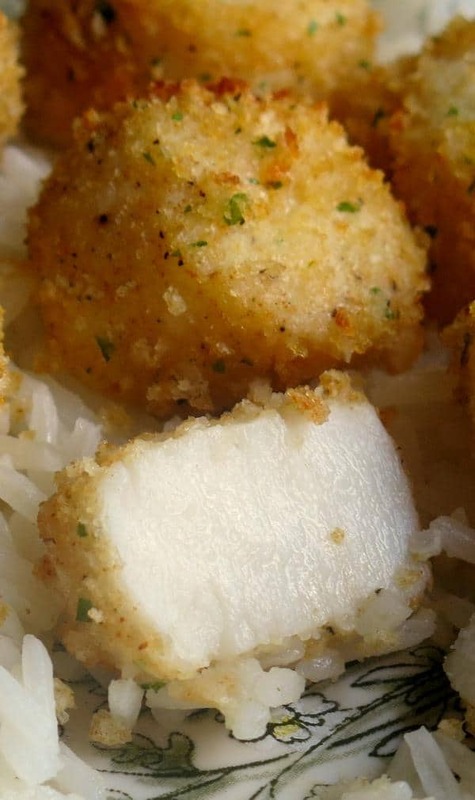 Lift the butter-coated scallops into the bag with the breading. (The canister really comes in handy for this step.) Seal the bag tightly (emphasis deliberately added again) and flip the bag around to coat the scallops. Shake…and bake…it works! Cook the scallops on a pan coated with cooking spray that is suitable for broiling. Have some extra breading left over in the bag? Throw it on top of the scallops. If you are going to freeze the scallops, then stop right here and put a lid on the pan and wrap the tin in plastic wrap. Label it. Freeze it. Now, sit back with satisfaction because you have a great thing in your freezer. Otherwise, broil the scallops for about 10 minutes with the rack adjusted to be near the top of the oven. (I had the rack on the second to highest level.) When you cut the broiled scallop it should be moist and white. Enjoy the broiled scallops over rice, in a salad…or all by themselves. They also make a tasty appetizer. Don’t you just want to pop one in your mouth right now? Make them ahead and freeze – Bread the scallops, but don’t cook them. Freeze them in a single layer in a tin. Make sure the tin is covered tightly and wrapped in plastic wrap. Store for up to 2 months in freezer for the best quality. When you are ready to cook them, allow them to defrost in the refrigerator over night and then cook according to the instruction. Make it dairy free – Use dairy free butter, leave out the Parmesan cheese and use Panko breadcrumbs. My daughter loves this preparation. Keep it healthy – Use whole wheat breadcrumbs and a light butter or margarine alternative. Use frozen scallops in the make ahead process – If the scallops you are purchasing were previously frozen, you don’t want to re-freeze them. 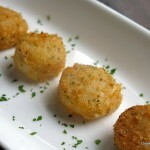 However, you can follow the breading steps using frozen scallops. Seafood always seems like indulgent, dining-out food to me which is why I love to surprise everyone with it on a seemingly ordinary day. (Is there such a thing?) Whether it’s a party or a regular ole Tuesday, it’s easy to enjoy these broiled scallops with a lightly-breaded Parmesan crust. It's easy to make Perfect Broiled Scallops in a Parmesan Crust. In minutes, you will have a memorable dinner or appetizer. Pat sea scallops dry with a paper towel and place in a plastic bag that seals or a bowl. Melt butter in the microwave oven or on the stove-top. Add olive oil to the bowl with the melted butter and stir to combine. Pour butter mixture over scallops. 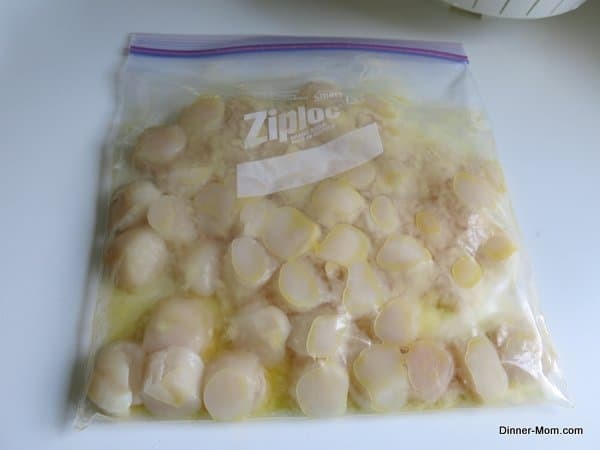 If using a bag, seal bag tightly and turn to coat scallops with butter. Set scallops aside. Add the remaining ingredients to an empty plastic bag or clean bowl and stir to combine. 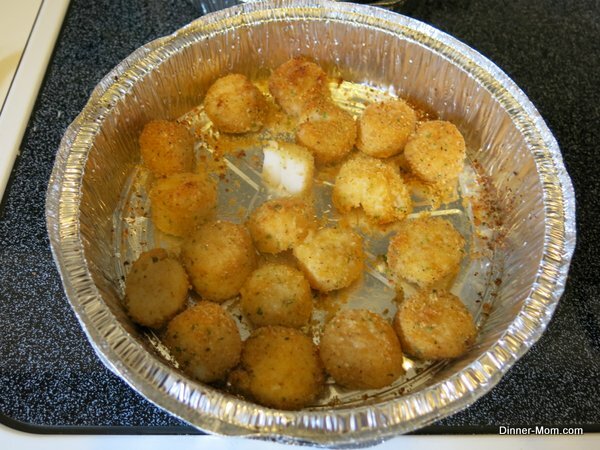 Lift scallops coated with butter into the breading bag or bowl. 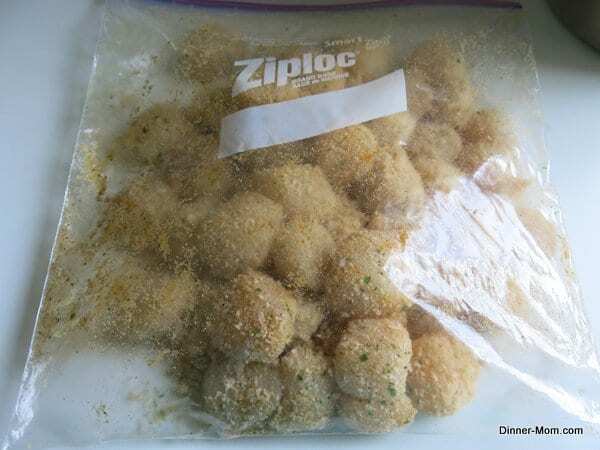 If using a bag, seal bag tightly and turn until scallops are coated with breading. 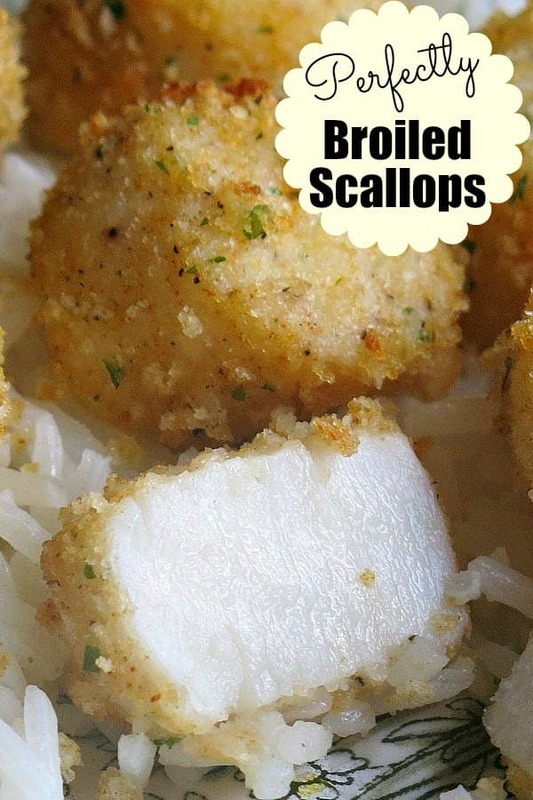 If using a bowl, roll scallops in breading until coated with breading. Place scallops on a baking sheet coated with cooking spray and broil scallops for 10 minutes with the rack near the top of the oven. To make ahead and freeze, prepare scallops through breading step. 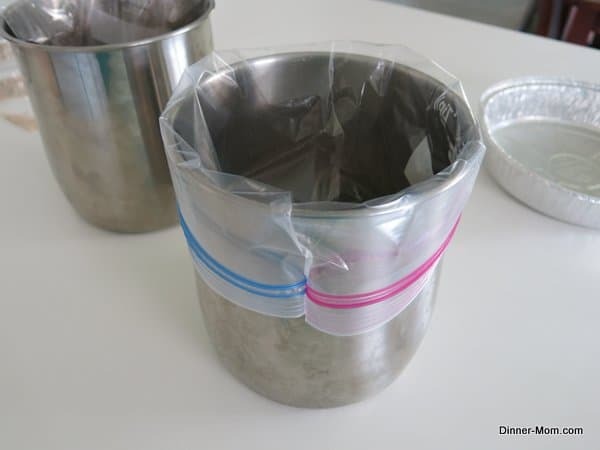 Freeze in a single layer in a tin, cover and wrap with plastic wrap. Defrost overnight and then cook according to instructions. Thanks for the recipe! I felt like I was eating in a gourmet restaurant. Very easy to prepare. Definitely a keeper! I have to try these! Scallops are my favorite – the seafood I wish I could eat everyday! But they are so pricey at the store. I always get them in the summer when they are on sale. These were fantastic! Thank you for such a great recipe! This was just what I needed! I had some “garlic gravy” mojo de ajo in the fridge, so I used that for the butter/oil combo. And I added some shredded coconut in the dry mix. The time, method, and temp given here worked perfectly. 12 sea scallops cost me about $17, but it was a meal that would have cost us much, much more if we had dined out. I kept side dishes on the mild side (rice, edamame beans, asparagus) so the scallops were the star. Thanks so much! PS: the sugar in the coconut did get pretty brown under the broiler. If I did it again, I’d leave it out or use unsweetened coconut. OH MY GOD!!!!! delicious and SO EASY!!! I added a tiny bit of basil – YUMMY! Awesome! Thanks for sharing. The basil sounds like a very nice addition…I’ll be trying that myself next time! I have bay scallops in the freezer – can I use them for this recipe? 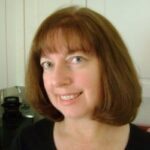 If so – is the broil time adjusted? Hi! You can use bay scallops but they will cook very quickly, maybe half the time. Just keep an eye on them and enjoy! Thanks for reading! Broil on high. Enjoy! Thanks so much for stopping by. You made my day! 🙂 It’s one of my favorite recipes too! Ok, I must not understand broiling. I followed the recipe and put it on the 2nd rack below the coils and the breading started to burn. So I finished them off at 400 degrees. What did I miss about broiled on high for 10 minutes…because my brain told me they will burn. But they were tasty anyway! Thanks for commenting. I can’t tell exactly what happened…but, there certainly is not a problem cooking them at a lower temp or on a lower rack. I’m glad you still liked them! This recipe looks fantastic but I am ditching the plastic bags and just rolling them in the crumb mixture in a bowl. FYI: Putting anything very hot into a plastic bag leaches the chemicals from the bag onto the food. Thank you for the awesome recipe for breaded, broiled scallops. I know they are going to be delicious! My mouth is watering for dinner tonight! Cooking this for the first time now. I didn’t think about the Plastic part(other than the hot butter/oil might melt it. Next time I will just add the scallops to the pan I melt it in. And there is definitely more breading mix than is needed… Oh, It’s Ready! This was a great recipe for company, I wanted to sear the scallops, but it is just too cumbersome for a dinner party. I was able to prepare these in advance and pop into the broiler (8 minutes) and they were lovely. I served with lemon asparagus risotto. This was a hit for my Valentine’s Day dinner party. Thanks so much for your comment. I’m thrilled that you enjoyed them! Mine came out mushy. I don’t know what I did wrong. I did pat them dry real good. I purchased them fresh and froze them. I defrosted them to make this recipe, but it just didn’t work for me. Plus, my scallops were very large. Will try again. I’m so sorry that they did not work out. If you are buying fresh scallops, then try prepping and freezing and cooking from frozen. I hope that helps. I use this recipe every time I have scallops–it’s a favorite! My husband doesn’t like scallops so I throw a flounder filet in with the scallops and cook the same way. Thanks so much for your comment! I’m thrilled that you like it and I”m going to have to try it on flounder too! can these be baked instead of broiled? If so, at what temperature and for how long? Hi! You can bake them, although they may not be quite as crispy on the outside. Bake at 350 degrees F for about 15 minutes or 375 F for about 12 minutes.